For one brief shining moment after the 2015 detection of gravitational waves from colliding black holes, astronomers held out hope that the universe's mysterious dark matter might consist of a plenitude of black holes sprinkled throughout the universe. University of California, Berkeley, physicists have dashed those hopes. Based on a statistical analysis of 740 of the brightest supernovas discovered as of 2014, and the fact that none of them appear to be magnified or brightened by hidden black hole "gravitational lenses," the researchers concluded that primordial black holes can make up no more than about 40 percent of the dark matter in the universe. Primordial black holes could only have been created within the first milliseconds of the Big Bang as regions of the universe with a concentrated mass tens or hundreds of times that of the sun collapsed into objects a hundred kilometers across. 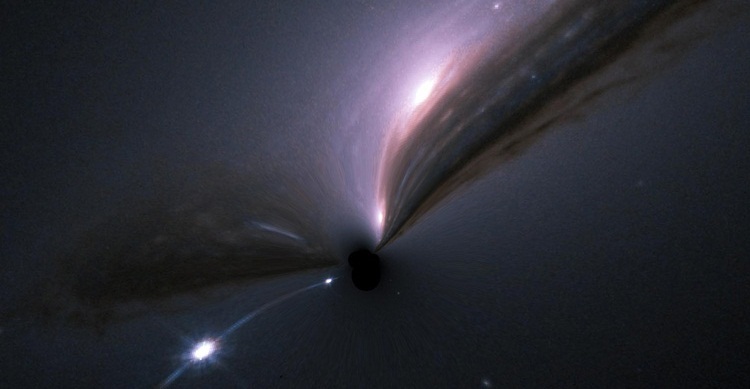 The results suggest that none of the universe's dark matter consists of heavy black holes, or any similar object, including massive compact halo objects, so-called MACHOs. Dark matter is one of astronomy's most embarrassing conundrums: despite comprising 84.5 percent of the matter in the universe, no one can find it. Proposed dark matter candidates span nearly 90 orders of magnitude in mass, from ultralight particles like axions to MACHOs. Several theorists have proposed scenarios in which there are multiple types of dark matter. But if dark matter consists of several unrelated components, each would require a different explanation for its origin, which makes the models very complex. "I can imagine it being two types of black holes, very heavy and very light ones, or black holes and new particles. But in that case one of the components is orders of magnitude heavier than the other, and they need to be produced in comparable abundance. We would be going from something astrophysical to something that is truly microscopic, perhaps even the lightest thing in the universe, and that would be very difficult to explain," said lead author Miguel Zumalacárregui, a Marie Curie Global Fellow at the Berkeley Center for Cosmological Physics. An as-yet unpublished reanalysis by the same team using an updated list of 1,048 supernovas cuts the limit in half, to a maximum of about 23 percent, further slamming the door on the dark matter-black hole proposal. "We are back to the standard discussions. What is dark matter? Indeed, we are running out of good options," said Uroš Seljak, a UC Berkeley professor of physics and astronomy and BCCP co-director. "This is a challenge for future generations." The analysis is detailed in a paper published this week in the journal Physical Review Letters. Their conclusions are based on the fact that an unseen population of primordial black holes, or any massive compact object, would gravitationally bend and magnify light from distant objects on its way to Earth. Therefore, gravitational lensing should affect the light from distant Type Ia supernovas. These are the exploding stars that scientists have used as standard brightness sources to measure cosmic distances and document the expansion of the universe. Zumalacárregui conducted a complex statistical analysis of data on the brightness and distance supernovas catalogued in two compilations - 580 in the Union and 740 in the joint light-curve analysis (JLA) catalogs - and concluded that eight should be brighter by a few tenths of a percent than predicted based on observations of how these supernovas brighten and fade over time. No such brightening has been detected. Other researchers have performed similar but simpler analyses that yielded inconclusive results. But Zumalacárregui incorporated the precise probability of seeing all magnifications, from small to huge, as well as uncertainties in brightness and distance of each supernova. Even for low-mass black holes -- those 1 percent the mass of the sun -- there should be some highly magnified distant supernovas, he said, but there are none. "You cannot see this effect on one supernova, but when you put them all together and do a full Bayesian analysis you start putting very strong constraints on the dark matter, because each supernova counts and you have so many of them," Zumalacárregui said. The more supernovas included in the analysis, and the farther away they are, the tighter the constraints. Data on 1,048 bright supernovas from the Pantheon catalog provided an even lower upper limit - 23 percent - than the newly published analysis. Seljak published a paper proposing this type of analysis in the late 1990s, but when interest shifted from looking for big objects, MACHOs, to looking for fundamental particles, in particular weakly interacting massive particles, or WIMPs, follow-up plans fell by the wayside. By then, many experiments had excluded most masses and types of MACHOs, leaving little hope of discovering such objects. At the time, too, only a small number of distant Type Ia supernovas had been discovered and their distances measured. Only after the LIGO observations brought up the issue again did Seljak and Zumalacárregui embark on the complicated analysis to determine the limits on dark matter. "What was intriguing is that the masses of the black holes in the LIGO event were right where black holes had not yet been excluded as dark matter," Seljak said. "That was an interesting coincidence that got everyone excited. But it was a coincidence." confine in things from a wide gathering of outcast affiliations. Mcafee.com/Activate .com is an autonomous help and specialist organization for mcafee.com/activate most secure remote specialized administrations for all McAfee items. can be used with no other individual or with other information to see, contact, or locate a specific individual, or to see a man in setting. This is horror by the way thanks for sharing effective information with us.